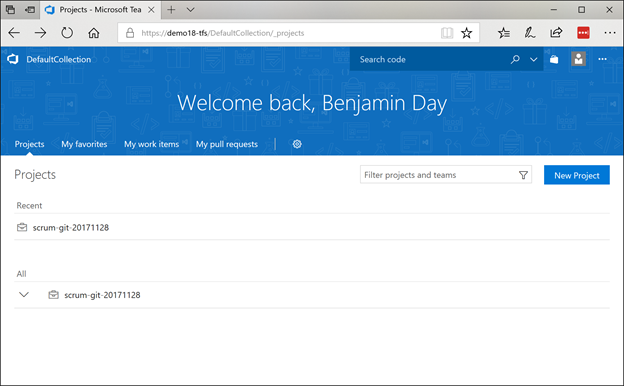 Howto: Install TFS2018 / VSTS Build Agent on Windows Server Core – Benjamin Day Consulting, Inc.
Here’s a guide to walk you through the process of creating a build server on Windows Server Core. If you’re not already familiar with Windows Server Core, here’s a quick overview. Think of it as Windows Server 2016 with all the extra, unnecessary stuff pulled out. This means that it uses a lot less disk space and a whole lot less memory. The minor downside is that you don’t get the pretty and helpful graphical user interface (GUI) that you’re used to. You get a command line window (cmd and PowerShell) and that’s about it. 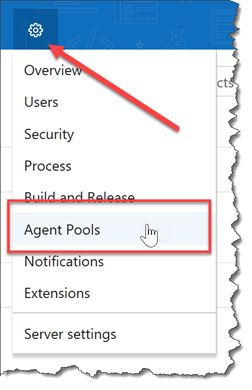 Another way of thinking of this chapter is that it will walk you through how to install the TFS2018 / VSTS build agent using only the command line. Since the command line is available on the full version of Windows, you can use these same steps to install the build agent on pretty much any version of Windows. You’ll need to do this step from a machine with a web browser. If you’re planning to install the Agent on Windows Core, then you’ll have to do this chunk of steps from a different machine. Just to keep people guessing, Microsoft sometimes changes the URL for downloading the build agent bits. In order to make sure that you’re installing the latest version of the build agent, I’m going to walk you through how to get the URL for the latest version. On the right side of the menu bar, there is a gear icon. You should now see the admin screen for you team project collection and you should be looking at the Agent Pools tab. There should be a button that says “Download agent”. A dialog should pop up that shows you the download and installation info for Windows, Mac OS / OS X, and Linux. The URL for the build agent download should now be in your clipboard. The value should look something like https://go.microsoft.com/fwlink/?linkid=858950. You’re going to need this value in a later step. Make sure that you don’t lose this value! 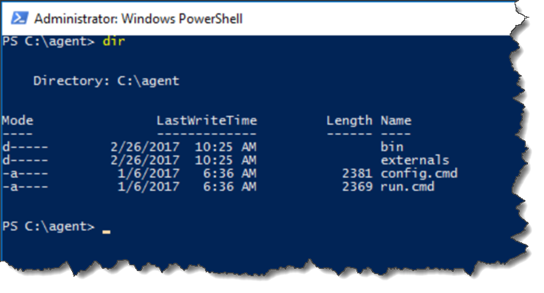 Next I’m going to walk you through the process of creating a PowerShell script to download the build agent zip and extract it. You might be wondering why I’m doing this. You’re probably thinking “why doesn’t he just simply open a browser and download the zip?” Well, the reason why is that there isn’t a browser on Windows Server Core and that means that downloading the agent installer zip is kind of tricky. Write-Output "Starting to extract '$toFilename' to '$agentDir'..."
Write-Output "Agent has been extracted to '$agentDir'." Write-Output "Run config.cmd to configure the agent." Now that you have that script, it’s time to run it from PowerShell. But chances are pretty good that you’re looking at a command prompt window rather than a PowerShell window. That’s easy enough to fix. Your window should look something like this next image. Let’s verify that this extracted as expected. The screen should look something like the image above. Now that the agent bits are deployed to disk, you’re ready to start configuring it. This guide assumes that you’re planning to run this agent in a Windows domain and that the TFS machine is in the same domain as the agent. I’m also assuming that you intend to run this agent as a service rather than as an interactive process. 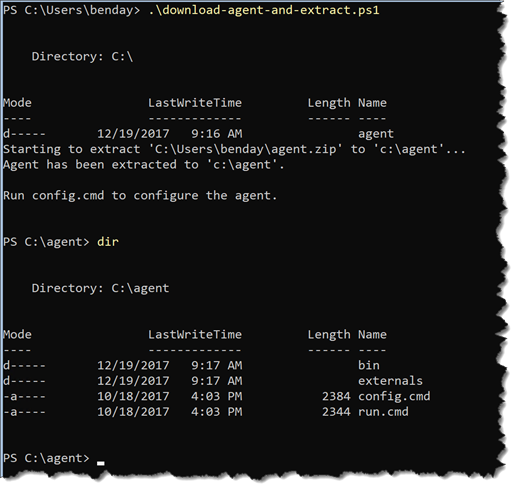 Recommendation: The agent can be configured to run as NT AUTHORITY\NETWORK SERVICE but I think that this makes permissions management confusing when you’re creating and running builds. I strongly recommend that you run the agent as a service using a known service account that is based on an Active Directory user rather than one of the build-in service accounts like NETWORK SERVICE. This guide will assume that you’re following this recommendation. Authentication Type: By default, authentication is based on the service account’s Windows logon. This mode is called Interactive. In order support more complex scenarios and multiple platforms, there are also several other options. This guide will show you how to do Interactive mode. User name & password for the agent service: These are the credentials for the service. In my case, I’ve created an Active Directory user named “tfsbuild”. The fully qualified username for this user is “DEMO\tfsbuild”. When you’ve got these values, you’re ready to run the config process. When prompted, enter the following values. When the config process has completed, you should see a message that says something like “Service vstsagent.demo17-tfs.DEMO17-BUILD started successfully”. If you open the browser and go back to the Agent Pools tab for TFS, you should now see your new build agent in the list of Agents. You’ve successfully configured a build agent on Windows Server Core. — Looking for help with your TFS or VSTS build & release infrastructure? Do you have a whole lot of old XAML-based builds or Release Management 2013 releases that need to get upgraded? 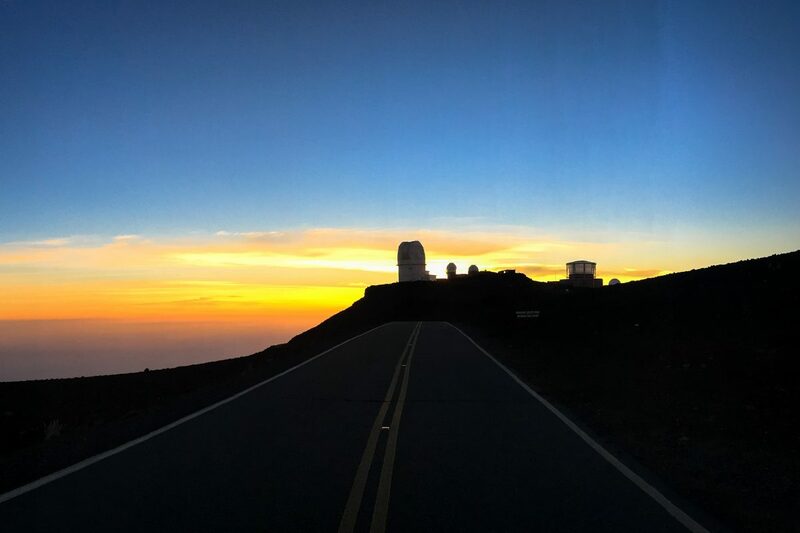 Not sure how to get going with DevOps, Continuous Integration, and Continuous Deployment? We can help. Drop us a line at info@benday.com. 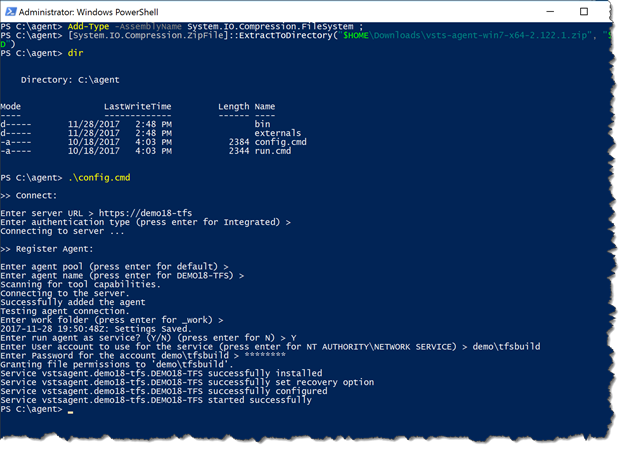 7 Responses to "Howto: Install TFS2018 / VSTS Build Agent on Windows Server Core"
great information, is there a way to script out the configuration of the agent with powershell ? Great post, but i have a question, can we install tfs2018 in a windows server core? Absolutely. My demo rig of TFS2018 on my laptop runs on Windows Server Core. and do you have and installation guide for that.